Whether you're new to the world of email or you have been communicating online for years, it's important to keep your email skills and practices current. Picking up where we left off in Part 1, I'll continue providing you with computer tips and tricks in Part 2 of "Everything You Need to Know about Using Email: The New Netiquette." 11. If you include your email address on your business card or letterhead, you're placing the world on notice that email is a viable means of contacting you. So if you share your email address with others, you have an obligation to check your email daily. 12. Don't send email, then telephone the recipient and ask, "Did you get my email?" Be patient. Waiting at least 24 hours or through the next business day is an appropriate amount of time for a response. Following up with another email is good email netiquette, but keep it light, e.g., "It's been a day or two since I contacted you. I didn't receive a response, so I wanted to check to be sure you received it." If another 24-48 hours pass without a response, consider that lack of response as your response. If you send email with an invalid or inaccurate email address, chances are it will bounce back to you as "Undeliverable," so you'll know it didn't arrive. Otherwise, assume your email arrived as intended. 13. All Internet connections are not equal. If you have high-speed access to the Internet, good for you. But don't assume everybody else does. Before you send a 10MB file attachment and tie up your recipient's connection for hours, request permission or ask if there's a preferred time to send that large file. Be sensitive to the time your email is going to require of other individuals. The last thing a busy email recipient wants is to be held hostage for an hour while digital photos of your last summer's kayaking trip downloads. 14. Avoid attaching files. Helpful computer tips and tricks include the fact that attachments can be carriers of viruses and are a source of concern to most recipients. The ability to send email does not give you the right to place a file on another person's computer. If you must send a file, be sure to include information about the file in the body of your email. Tell the recipient what the name of the attached file is and what it contains. Including a disclaimer stating that you have checked the file for viruses (if true) and you believe it to be virus-free, but can't guarantee it, is good email netiquette. Always encourage recipients to check files for viruses. 15. Check incoming files for viruses. If you are the recipient of an email attachment, don't open it without checking it for viruses by using an updated virus-checking program. If you haven't updated your antivirus software recently, visit the software's Web site and download current virus definitions. Update your software as recommended by the software vendor. Mr. Modem's list of best Web sites for anti-virus software includes AVG AntiVirus. Enjoying this article about email netiquette? 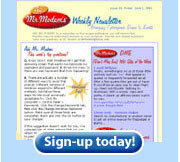 Then why not subscribe to Mr. Modem's Weekly Newsletter (www.MrModem.com) today! Computer tips and tricks, virus alerts, hoax information, plus prompt, personal responses to your computer questions! 16. Don't assume every recipient can view every file format. There is nothing that frustrates an email recipient more than receiving an attachment that is impossible to open because it was sent in an unreadable format. If you plan to send an Excel spreadsheet, for example, ask the recipient if he or she has Excel installed. Not all email programs can display HTML messages, either, so if you're including HTML or some other format that may look great on your system, don't assume your recipient has the same capability or is using the same email program you're using. 17. If you receive an email intended for somebody else, let the sender know. Just send a quick reply, "Sorry, but I received this email in error. I'm not the person you intended to send it to." Your response will be appreciated. 18. Don't overuse the "High Priority" designation. Most email recipients routinely ignore priority labels because so many people who spam email label messages "High Priority." Priority designations have long since lost their intended impact and purpose. 19. Avoid using labels or Subject line notations such as "Urgent" or "Important." Your sense of urgency is generally a big ho-hum to a recipient, anyway. Many people who spam email inboxes attempt to create a sense of urgency through the use of such terms, and you don't want your messages to be confused with spam. 20. Use a meaningful Subject line. Include a subject that provides some insight into the focus of your email. For example, when you're requesting help about a particular topic, good email netiquette suggests that it's better to say "Help with Windows XP," or "Help copying files," rather than simply "Help." And while we're on the topic of Subject lines, don't use the Subject line to start a sentence, then finish the sentence in the body of the email. It's not only annoying, but some email programs do not display the Subject line once email is opened, so the first sentence in the body of your email may appear as an incomprehensible fragment.